Lizo Mzimba of BBC News (if something happens in Doctor Who, he's the one who always reports it!) has confirmed that a number of missing episodes has been returned. It gave no details as to which ones they are or whose Doctor they are from, but they did confirm that further details, such as which episodes, will be revealed at a BBC Worldwide press conference later in the year. While we are not yet sure exactly what had been returned, it can believed to be at least two episodes from different serials due to the recent Radio Times post, however the revoke of the number could mean otherwise? What episodes do you think has been returned? The Web Of Fear? Enemy of the World? Although the article says "a number of episodes" not 106... Still, anything is good news! Probably being cagey because they're still trying to figure out what they've got and how much of it is in watchable condition -- this stuff's been sitting in a shed for 50 years, probably with a lot of heat and moisture. So you know, BBC News isn't the same as the BBC. BBC News, BBC Worldwise and BBC One are all officially different entities, like 20th Century Fox and The Sun: both owned by a parent company (until 2011), but different companies. BBC News isn't the BBC confirming it, it's just a news site reporting it, and they (also) haven't cited their sources. The rumor mill grist is pointing to a complete Enemy of the World, and all but one episode of The Web of Fear (with ep 3 or 4 still missing). Whatever it turns out to be is great, this is the best 50th anniversary present we could ever have hoped for! My only wish is to see "Power of the Daleks." Probably unlikely, but I can always hope. Well, it's being reported on other DW sites that Deborah Watling has confirmed that she, along with Fraser Hines, with be at the unveiling. So, this matches up. Really hoping it's episodes from The Power of the Daleks or The Web of Fear. In my mind, these stories are the most important of the missing serials to the Doctor Who story. 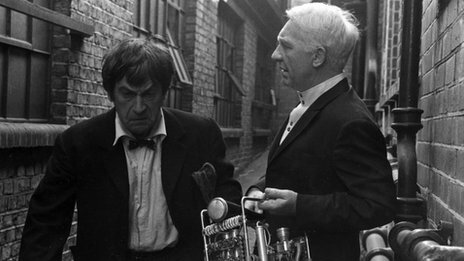 One introduces a regenerated Doctor for the first time, and the other introduces Colonel Lethbridge-Stewart. Plus, the Web of Fear includes the Great Intelligence, which has recently been featured as the main antagonist. It's hard to beat that.